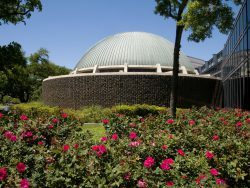 Travel through the cosmos as high-resolution video technology projects images of planets, stars, meteors, solar systems and entire galaxies on the domed surface of the Burke Baker Planetarium – named one of the six best planetariums to visit in the United States by geeksugar. The dome theatre is also used to train NASA Space Shuttle astronauts in identifying starfields! The latest digital technology has transformed planetariums from rooms with star-filled roofs to immersive digital dome theaters able to carry audiences from the Big Bang to the nucleus of a cell. The Museum has also added one upgrade to its full-dome system each year – improving the quality of each successive visit.